An unforgettable young girl goes on a road trip adventure through the American South with her father—but what they're leaving behind is as important as what lies ahead. Dolly is seven. Her number-one all-time most-best friend is her stuffed horse, Clemesta. One Saturday morning, Dad sweeps them both up into his arms and carries them off on a week-long road-trip adventure. The destination: the best place in the world. The first days on the road are incredibly exciting. Dolly has never been allowed to miss school, or gone on a trip, or had Dad all to herself. They stop along the way for milkshakes and shopping sprees and a theme park. They get to sleep in motels, eat junk food, and watch cartoons on TV. But as they get farther from home, Clemesta begins to whisper things in Dolly’s ear. Things like, “We need to eat some vegetables,” and “When do we get to see Mom?” As much as Dolly doesn’t want to spoil the adventure, even she has to admit that things aren’t quite right. Dad is acting strange, and sometimes scary, and he seems to think that someone is following them. 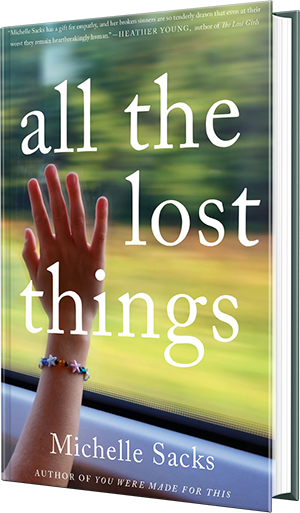 Through the eyes of a remarkable narrator who leaps off the page, All the Lost Things charts a life-changing journey, and reveals the surprising intersections of love, truth, and memory.